With their groundbreaking building design for Scott Hall—a recently completed Nano-Bio-Energy Technologies Building at Carnegie Mellon University—architects Michelle LaFoe and Isaac Campbell show how their studio's outside-the-box thinking and imaginative problem solving yielded an innovative design vision for this prestigious project. By weaving together architecture, contemporary fabrication technology, and an ingenious campus planning approach, they reveal how they won an invited national design competition with a design reverent to its designated place. 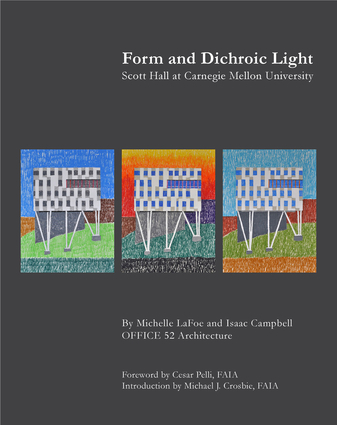 With numerous illustrated examples, the authors share their studio's creative process and demonstrate how they reimagined the prescribed planning strategy for Scott Hall to produce a unique, energy efficient design for the building, its complex site, and its demanding research program. Michelle LaFoe, AIA, is a licensed architect and accomplished artist, who has designed award-winning higher education, museum, and architectural installation projects. Professional accolades include a Fulbright-Hayes Scholarship and a grant from the Graham Foundation for Advanced Studies in the Fine Arts. Isaac Campbell, AIA, has planned, programmed and designed highly sustainable environments and award-winning buildings for educational institutions, corporate, and private clients in the United States and abroad for more than 25 years. His design work has been recognized with awards from both the American Institute of Architects and the Society for College and University Planning. Major projects include the Chubu Teiju Cultural Center and Museum in Kurayoshi, Japan and the New York Times Headquarters Competition in New York City.